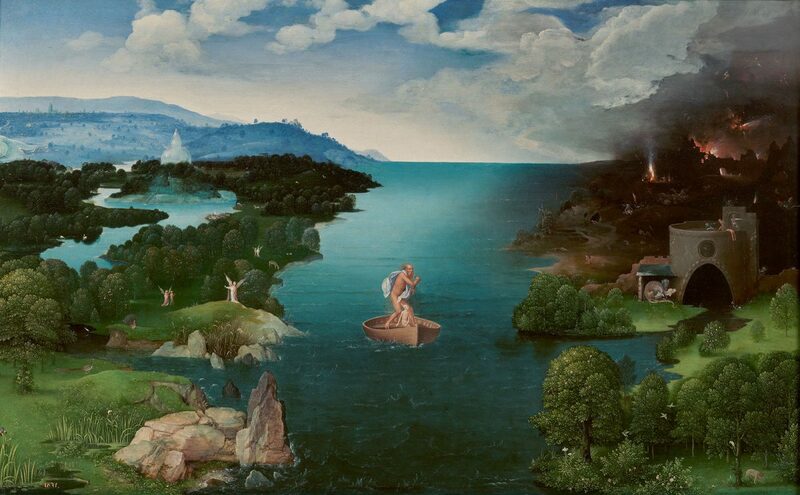 Joachim Patinir, ‘Landscape with Charon Crossing the Styx’. Oil on panel, 25.2×40.6 in. Prado Museum, Madrid. Death is a universal and inescapable feature of the human condition, but one that necessarily defies simple explanation. Every culture makes some attempt at coming to terms with the phenomenon, and among the matters that require attention concern where we go (if anywhere) upon dying, and what fate awaits us upon arriving there. The ancient Greeks understood the answer to this question to lie right under their noses (and feet): in the Underworld. Greek conceptions of the Underworld were neither uniform, simple, nor static, and from its literary origins in the Homeric epics, through its articulations in a range of intellectual traditions, the way they envisioned the abode of the dead was ever-evolving, and the ways it was utilised ever-expanding. But it was always the case that the way the Greeks imagined the abode after death in turn shaped and was shaped by their wider thinking concerning life, death, and their place in the cosmos. The result of this process was a rich and fascinating tradition of thought that continues to inflame our imagination, and provoke our thought to this day. And to do full justice to the complexity and flexibility of the tradition this conference aims to consider Greek understanding of the Underworld within a distinctly interdisciplinary context. This will involve: i) exploring how poets and prose writers in various genres (including poetry, philosophy, and religious texts) imagined the Underworld, and the important role of the interplay between these genres in shaping this thinking; ii) discussing how conceptions of the Underworld both reflected and influenced popular beliefs about the afterlife; and iii) considering the relationship between Greek descriptions of the land of the dead and those of others cultures (particularly that of the Near and Far East). Speakers for the conference will be from a variety of disciplines, including Greek literature, ancient philosophy, theology, Near Eastern studies, and Oriental studies, all of whom share an interest in conceptions of death and the afterlife. Registration is now open and list members are warmly invited to attend. Thanks to a generous donation from the Faculty of Humanities we are pleased to announce that there will be NO registration fee. Please let us know whether you would like to join us for a wine tasting event on Friday 7th, for £5.